Congress has completed the procedural steps necessary to begin conference negotiations on the two 2018 farm bills produced by the House and Senate (Rodriguez Aug. 1, 2018). Additionally, the Congressional Budget Office has updated its score of each bill (CBO July 24, 2018). While traditionally in recess during the month of August, reports are that conference negotiations will take place and some in Congressional leadership are pushing for an aggressive timeline to complete work and pass the final bill before the September 30, 2018 expiration of the 2014 Farm Bill. The farm bill has come a long way in a short time this summer, whether it can complete its journey likely depends mostly on two issues. Those issues are discussed here. 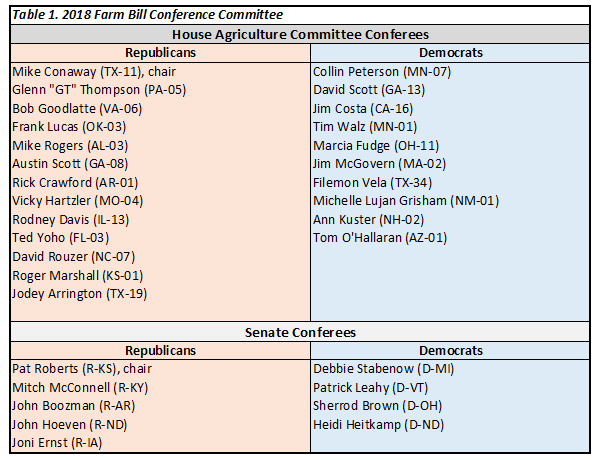 The 2018 farm bill conference committee will consist of 9 Senators to conference with 47 Representatives from the House. Note that House conferees cover multiple committees with jurisdiction over some of the provisions in the bill (Dreiling Aug. 2, 2018; Hagstrom July 18, 2018). For the House, 13 Republicans and 10 Democrats from the Ag Committee will lead the conference negotiations supplemented by leadership from other committees (House Ag July 18, 2018; House Ag Democrats July 18, 2018). All Senate Conferees are members of the Senate Ag Committee (Table 1). Conference committees tend to work by negotiation, compromise and consensus but where disagreements cannot be settled the conferees vote. Conferees also vote to report the final conference report back to Congress where each chamber has to pass it. Conference votes are by chamber, requiring a majority of the House conferees and a majority of the Senate conferees to agree to an amendment or final report. The conference committee will have to resolve a large list of differences between the two bills. There are likely to be some traditionally-difficult matters, such as changes to farm programs and dairy, and especially limits on farm program payments and eligibility requirements (farmdoc daily, July 3, 2018; June 19, 2018). They will also have to work out some important differences over the treatment of rural development and renewable energy investments. But there are few other relatively thorny or politically-difficult issues to resolve. This is especially true for Title I and crop insurance, which usually complicate conference negotiations. Therefore, the success or failure of the farm bill conference likely rests on only two issues: SNAP and conservation. 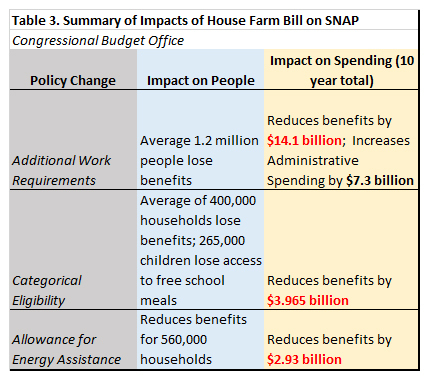 A few basic facts about SNAP, employment and poverty provide important perspective on the political controversies with the House farm bill’s changes to the program. Table 2 provides a snapshot compiled from USDA’s Food and Nutrition Service (SNAP Data), from the U.S. Department of Labor, Bureau of Labor Statistics (Employment Data; Current Employment Statistics) and from the U.S. Census Bureau (Data, Income and Poverty in the United States: 2016). Importantly, spending on SNAP in 2017 was more than $12 billion below spending from its peak in 2013. Additionally, participation has decreased by more than 8 million persons since peaking in December 2012. Almost all of this can be attributed to a significantly improving economy recovering from the recession that began in 2008. CBO estimates that participation and spending will continue to decline (farmdoc daily, April 12, 2018 (Figure 2)). This is a key source of controversy; without making any changes to the program, participation and spending have been decreasing and will continue to do so unless the economy stalls or reverses. Also adding controversy are apparent misperceptions about the program and those who receive assistance from it. SNAP benefits help persons and families purchase food, a basic human necessity. It is not solely tied to, or in response to, unemployment. It is designed for persons and families with low incomes, defined generally as less than 130% of the poverty level (gross monthly income), and thus is counter-cyclical with the economy. As such, SNAP participation aligns closely with the number of Americans below the official poverty line. Most SNAP recipients are elderly, disabled or children; those who are not, are often employed but they simply do not earn enough (Bauer and Whitmore-Schanzenbach July 27, 2018; Butcher and Whitmore-Schanzenbach, July 24, 2018). Finally, significant controversy is due to the specific changes to SNAP. According to CBO analysis, the House farm bill will reduce billions in spending on benefits which is expected to impact millions of people, hundreds of thousands of households. At the same time, the House farm bill will increase administrative and other non-benefit costs and add paperwork requirements and bureaucratic barriers for those seeking assistance (farmdoc daily, July 3, 2018; May 24 2018; April 26, 2018). Updated CBO cost estimates are presented in Figure 1 and Table 3 summarizes CBO’s conclusions about the most notable impacts on persons and households. One specific example from CBO’s analysis that highlights the issue are the provisions to include additional work requirements. CBO has estimates that the House bill will reduce spending on benefits to people by over $14 billion while increasing administrative spending by more than $7 billion (fiscal years 2019-2028). All of this was well understood before the House Ag Committee began writing its farm bill. It was also understood that such highly partisan and ideological changes were unlikely to pass the Senate. Moreover, a partisan dispute in the House over SNAP—including controversial work requirements—created significant problems for the 2014 farm bill. House leadership refused to give the 2012 version of the farm bill time on the floor before the election and when the House considered the bill in 2013 it was initially defeated on the floor. It is difficult to understand why the House Ag Committee elected to reignite this controversy in 2018, but that position is the biggest hurdle to successfully completing the farm bill process. Conferencing conservation is a different matter. Both bills reduce working land programs, but the exact impacts of the changes are more difficult to determine; CBO does not provide any analysis about expected impacts on farmers or landowners. To begin, Figures 2 and 3 illustrate CBO’s updated estimates of the changes in spending for the conservation titles in the House and Senate farm bills, respectively. The CBO scores for the bills are little changed from its previous estimates. Most notable, CBO estimates that the House bill reduces Conservation Stewardship Program (CSP) funding by $12.6 billion over 10 years (FY 2019-2028), while increasing Environmental Quality Incentives Program (EQIP) outlays by $7.692 billion. This indicates that a significant portion of the CSP baseline is shifted to EQIP as CSP contracts expire. For the Senate bill, reductions in EQIP and CSP appear to be used to offset increased spending on ACEP and RCPP and overall spending for the title is unchanged. The key difference between the two bills is elimination of CSP by the House and the shifting of baseline to EQIP as existing CSP contracts expire. Both programs are important for natural resources conservation and farmers but have different objectives and operation. Such a substantial change in policy raises many questions about the impacts on farmers and natural resources for which answers are not currently or readily available. CSP is an acreage-based program, ensuring it is tied to farmed land. Farmers meeting a threshold of conservation on their farms enter into five-year contracts for annual payments in return for agreeing to maintain and improve conservation on the entire farm. CSP is complicated, with added complexity for farmers with multiple landlords. It does, however, encourage a more comprehensive conservation focus on the farm across fields and practices. It also provides a five-year income stream, particularly important given current challenges with low prices and financial stress. For perspective on the importance of the impact on farm income, the following is an example using a central Illinois high productivity case farm (farmdoc daily, March 6, 2018). For this example, the farmer is assumed to be doing practices or enhancements that qualify for CSP payments under the current program. If the farmer qualifies for an existing activity payment of $7.50 per acre (the NRCS base rate for an existing activity), the difference in average net farm income over the five-year period could be more than $13,000 per year. A farmer practicing multiple qualifying activities may reach the $40,000 annual payment cap, which represents a significant contribution to farm income. Consider that most practices that qualify for CSP payments come with a direct cost to the farmer. Under the current economic environment the average farmer may not be able to afford to add such expenses and make those improvements without assistance. As a participant in the CSP program the farmer is rewarded for adding conservation to the farm management, making improvements that benefit the environment as a whole but may not provide any direct return to the farm. One way to look at this is through common financial ratios that provide a deeper view into the financial health of a farm. For example, the debt coverage ratio is a measure of solvency and it indicates an ability to meet long term financial obligations. A ratio above 150% is considered strong, while a ratio below 110% is weak. Debt obligations exceed income when the ratio falls below 100%. Given the considerable amount of initial and continued capital needed to operate a farm, the longevity of the farm is dependent on a level of income that can support the debt obligations. 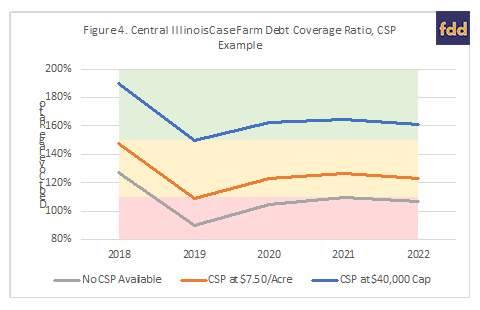 Figure 4, therefore, compares the case farm debt coverage ratio for three scenarios: costs for practices without CSP assistance; assistance at the base rate ($7.50 per acre) and CSP assistance at the $40,000 cap. Adding costs to this case farm in the current environment would harm the farm’s financial health, but CSP assistance helps considerably. Losing this income assistance for conservation on working farms thus raises real-world concerns. EQIP, by comparison, provides cost share assistance for specific conservation practices. The farmer pays for the practice and NRCS covers a portion of the cost. While important, it is not known how this change in policy will impact farmers and their bottom lines. The House does include multi-year stewardship contracting language (five or ten years) and an annual payment under the contract capped at $50,000 per year. How this authority will operate under the general EQIP funding as compared to CSP’s acreage-based program is an important question but one unlikely to be answered in conference. An additional question that may be as important is the level of funding for the annual contracting authority. The House farm bill restricts USDA from using more than 50% of total EQIP funds for these new stewardship contracts. Figure 5 compares the existing funds in the CSP Baseline with the maximum funding available from the House’s stewardship contracting language in EQIP. The EQIP Stewardship (brown) line represents the most that could be available for stewardship contracting authority. In practice, it could be much lower. This change raises further questions about the impact of such a potentially large shift in policy. Magnifying this concern about available funding—especially from a Midwestern perspective—are the provisions in both the House and Senate farm bills that would permit irrigation districts and drainage districts to compete directly with farmers for EQIP funding. This has the potential to shift conservation investments out of the Midwest to irrigated areas in the Southwest and West; it could also redirect conservation investments from farmers to these non-farm entities. Ideally, analysis of existing NRCS data and obligations would provide valuable information for Congressional negotiators about the implications of eliminating CSP, adding stewardship contracting authority to EQIP and redirecting funds to irrigation or drainage districts. Such analysis is not currently available and it is unlikely to be completed in a timely manner for conference negotiations. This may counsel further caution with the major policy changes in the House farm bill. Completion of farm bill reauthorization in 2018 is within sight for Congress. Achieving it, however, rests largely on whether the House insists on its controversial changes to the Supplemental Nutrition Assistance Program (SNAP). SNAP participation and spending has fallen significantly since peaking in the wake of the recession. Improvements in the economy, including reductions in unemployment, have contributed but millions of Americans remain below poverty thresholds and continue to use the assistance to purchase food. The initial defeat on the House floor and the Senate’s decision to avoid a similar fight seem to confirm that the House farm bill path on SNAP is questionable at best. For House conferees to insist on these SNAP provisions in conference—especially in light of Congress adding billions for cotton and dairy farmers before the farm bill and the Administration’s recent promise of $12 billion in additional farm assistance this year to help assuage the pain of the President’s escalating trade conflicts—would likely leave little chance of a farm bill reauthorization in 2018. House negotiators likely have to decide whether that effort is worth sacrificing a farm bill, as well as doing immeasurable damage to the coalition that has helped pass farm bills for more than forty years. A successful conference outcome could also be impacted by changes to conservation programs most notably the House’s decision to eliminate the Conservation Stewardship Program (CSP). Initial review of CBO estimates and historic program operation leaves more questions than answers and provides cause for concern. This is especially true for working lands conservation in Midwestern states such as Illinois and for farmers facing tough economic times with continued pressure to reduce nutrient losses, improve soil health and production sustainability. Analysis is needed to better understand the potential impacts of this change to conservation policy. The unknown consequences of such changes should counsel caution in conference. Coppess, J., C. Zulauf, B. Gramig, G. Schnitkey and N. Paulson. “Conferencing Conservation: Reviewing Title II of the House and Senate Farm Bills.” farmdoc daily (8):133, Department of Agricultural and Consumer Economics, University of Illinois at Urbana-Champaign, July 19, 2018. Coppess, J., G. Schnitkey, N. Paulson and C. Zulauf. “Progress and Potential Hurdles for the 2018 Farm Bill.” farmdoc daily (8):112, Department of Agricultural and Consumer Economics, University of Illinois at Urbana-Champaign, June 19, 2018. Coppess, J. and T. Kuethe. “Mapping the Fate of the Farm, 2018 House Edition.” farmdoc daily (8):95, Department of Agricultural and Consumer Economics, University of Illinois at Urbana-Champaign, May 24, 2018. Coppess, J., G. Schnitkey, N. Paulson and C. Zulauf. “Initial Review of the House 2018 Farm Bill.” farmdoc daily (8):75, Department of Agricultural and Consumer Economics, University of Illinois at Urbana-Champaign, April 26, 2018. Coppess, J., G. Schnitkey, N. Paulson and C. Zulauf. “Reviewing the CBO Baseline for 2018 Farm Bill Debate.” farmdoc daily (8):65, Department of Agricultural and Consumer Economics, University of Illinois at Urbana-Champaign, April 12, 2018. Swanson, K., G. Schnitkey, J. Coppess and N. Paulson. “Introducing the Gardner Farm Income and Policy Simulator.” farmdoc daily (8):39, Department of Agricultural and Consumer Economics, University of Illinois at Urbana-Champaign, March 6, 2018.